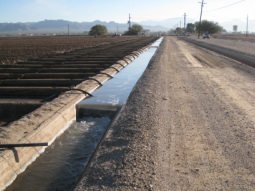 The Cortaro-Marana Irrigation District’s mission is to secure water from all sources, in order to provide water to lands within the District, primarily for irrigation purposes. Additionally, our mission includes the pursuit of all lawful activity that helps to sustain, promote and advance the economic viability of irrigated agriculture within its boundaries. Cortaro-Marana Irrigation District (CMID) serves the agricultural irrigation needs of the Marana, Avra Valley and Cortaro communities. The District owns 65 miles of pipelines and canals, providing irrigated water to more than 12,000 acres of farmland. The District also offers water storage and non-potable service within its service area. The District played an instrumental role in the formation of the Town of Marana. The municipality was incorporated in 1977 to protect the area’s farming industry and vital water resources. As the area has continued to experience significant urban growth, the district is committed to maintaining a healthy irrigation district to ensure the long-term viability of the region. Today, the Cortaro-Marana Irrigation District continues a rich history of irrigated water throughout this fertile region, which produces cotton, wheat, corn, alfalfa, lettuce, barley and other crops. The impact of these agricultural products extends to the far reaches of the globe, including China and Western Europe.